Winning The 2015 Blogelina Blog Beautiful Award is an honor and is downright exciting! The best part- I was gifted $1000 from Blogelina to donate to Dysautonomia International! This donation could go a long way to help spread awareness, support patients and families, and help fund medical research for Dysautomia. Thank you to Blogelina for hosting this wonderful award and providing this generous donation. Also, a HUGE thank you to everyone who voted for The Mindful Shopper! Your support means the world to me! This award is so meaningful because I created The Mindful Shopper to redirect my energy and thoughts into something positive, rather than to focus on my current life situation (home-bound due to illness). When I began, I knew nothing about blogging, marketing, or social media. I wasn’t even on Facebook. I thought Twitter had something to do with dating (seriously). I knew the basics about computers but nothing about coding or website design. I appreciated the art of blogging but had no understanding of what blogging really entailed. 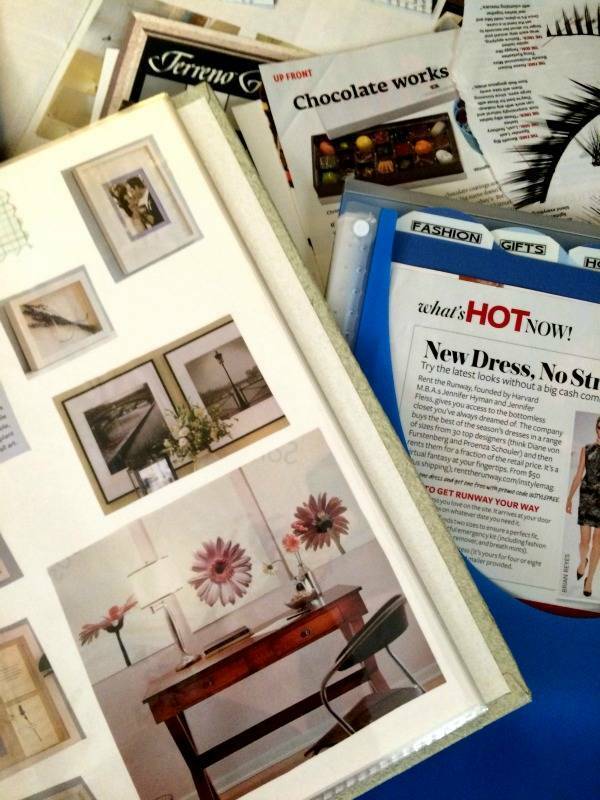 All I knew was that I had a passion for finding fun gift ideas, decorating my home, party planning, discovering fashion and beauty tips, and being creative. For years prior to getting sick, I had collected hundreds of magazine articles, pictures, and books about these topics and stored them all over my house. 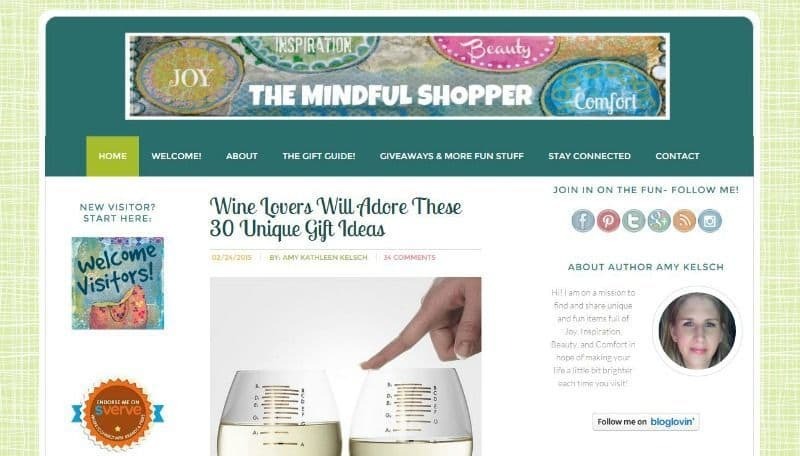 The Mindful Shopper became the perfect platform to share these fun ideas, products, and tips while giving me a creative outlet. Eventually I was blessed when artist extraordinaire Lise Meijer entered my life. She inspired me to revamp The Mindful Shopper and created a beautiful header and blog badges. 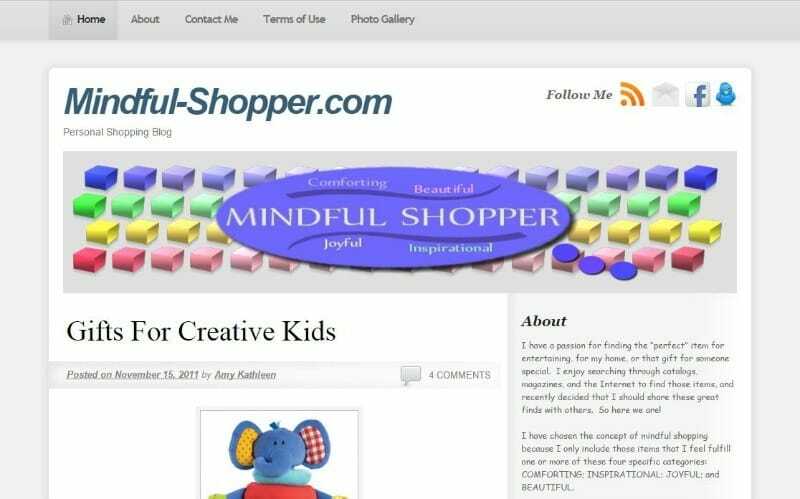 She really played and continues to play a big part in why The Mindful Shopper has a beautiful internet presence. In 2014, I was inspired to restyle The Mindful Shopper again. 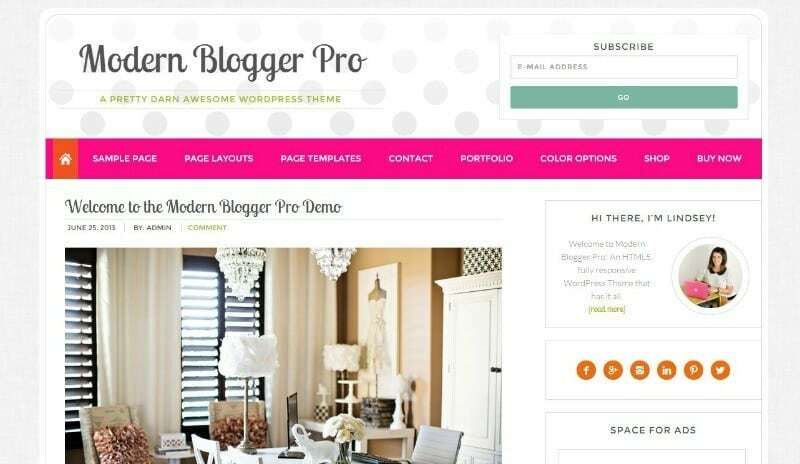 I upgraded my WordPress Theme to the Modern Blogger Pro Theme from Pretty Darn Cute Design (a theme is the template bloggers use to create a website). This theme gave me a great deal of flexibility in customizing the look of The Mindful Shopper. The Mindful Shopper is my personal space to create and share. Blogging is a beautiful thing and I am honored to have my little creation receive The 2015 Blogelina Blog Beautiful Award. I love blogging and can’t wait to see what the future holds! Thanks so much! Your comment means a great deal! Congratulations! That is quite an honor to have won. I definitely like that the prize was a donation to a charity of your choice–it makes a lot of sense to me. what a fantastic award! Congrats!!! What an honor; congratulations! How cool that your passion paid off in this way. Awesome! Thanks so much! I appreciate the kind comment! It was so fun to read your story! Congratulations! It’s wonderful to read about the growth of your blog. How much you enjoy it really comes through. Thank you! 🙂 I am so glad to hear this! This sounds like an awesome award! I’ve wanted to get involved with awards like this! Looks awesome!! Thank you! Your website is beautiful! You definitely could win this award! Congratulations on getting the blogelina beautiful blog award. What a wonderful thing to be able to give to your charity of choice. I love looking back and seeing how I’ve evolved in blogging over the years. I started in 2009 very slowly to document my son’s life and then blogging exploded from there. Never knew it could be what it is now. Yes, blogging is definitely a journey, an evolution of sorts mimicking life! Thanks for stopping by! It is so important to have something that gives us purpose in life. Funny how something as simple as a blog can do that for me. It surely is a blessing. Congratulations!! Love seeing the evolution of people’s websites. I just did a blog facelift a few months ago and it’s amazing what a change can do. Thank you so much! I just stopped by your blog and it is lovely! I will definitely be back to visit it again! Congratulations on the Blogelina Blog Beautiful Award, what an honor and accomplishment. I’m also using the Modern Blogger Pro Theme from Pretty Darn Cute Design on my site. It is so easy to change up to suit everyone’s personality. Thanks so much for the kind words. I just stopped by your site and I love it! If you don’t mind, I would love to know what plug-in you are using for the “like my site” widget in your sidebar. Very cool! Congrats on winning the award. From what I can see from your blog you definitely deserve it. It was also nice reading about how you started blogging. I love learning more about the bloggers behind the blog. Thank you so much for the kind comment! I hope you come back and visit again! Congratulations! It’s so amazing how far you’ve come. You’ve gone from blogging as a personal outlet to winning an award. That’s quite an achievement. Keep up the excellent work! I look forward to hearing of you winning more awards. Thanks for the lovely comment! I really appreciate it! 🙂 Thanks so much! I appreciate the comment! Congratulations, that’s a great accomplishments! I wish that I could learn how to design my own blogs though. I always hire someone to do it for me. You are doing such a great job with yours! Congratulations on winning the 2015 Blogelina Blog Beautiful Award! I loved reading about your blogging journey and can’t wait to see where you go with the blog. Plus it’s so cool that you could give $1,000 to such a good cause. Thanks so much!!! 🙂 Hugs to you! It is always fun to look back and see how a blog has changed over the years!! Congrats on your blogelina blogging award!! The blogging world is always changing and also the ways to promote social media for the blog as well. That is so awesome that you got that award and were able to get a donation to give to a charity for your winnings. I love it! Thanks so much! Yes, the best part is being able to donate money to charity! 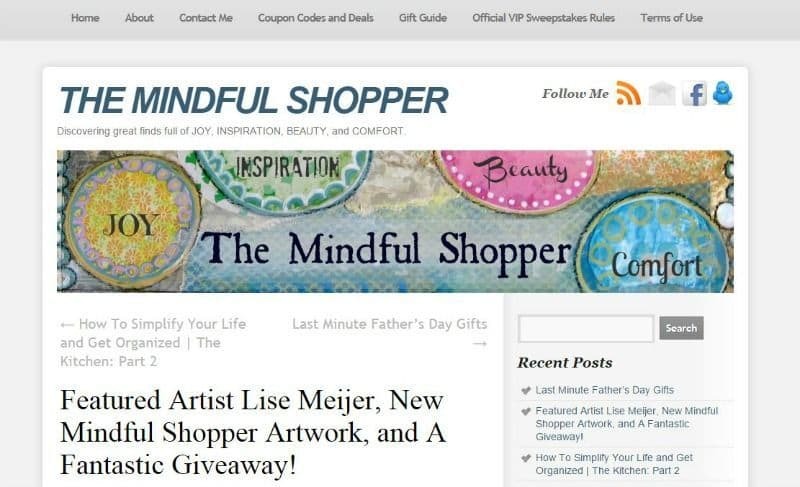 Thanks so much for stopping by The Mindful Shopper! That is so cool! Congratulations to you! Thanks so much! Blogging has been such a blesssing for me! First, Congratulations! That is truly awesome! It is such an amazing feeling when our blogs reach a point that we are awarded with something so amazing! I am very happy for you! Just shows that a lot of hard work will pay off in the end! Again, Congrats! Keep up the amazing work!